Texas did everything they could on Thanksgiving night beating the Aggies 49-9. The defense was dominant and [tag]Colt McCoy[/tag] may have secured the Heisman Trophy. The Longhorns wait to see how the BCS situation shakes out while we look at the top 11 performers from Thursday night. 1. [tag]Colt McCoy[/tag] – McCoy bounced back from a turnover filled sophomore season with arguably the best season a Texas quarterback has ever experienced. Texas A&M had been the bugaboo for the junior star until Thursday night. McCoy did everything once again for the Longhorns accounting for four total touchdowns and over 300 yards passing. He continued to be Texas’ number one running threat while completing his passes at a record breaking clip. Texas needed to impress the voters and their quarterback made sure they did. 2. [tag]Sergio Kindle[/tag] – There are a lot of players that deserved the top spot on Texas’ defense but Sergio is going to get the nod. Kindle was everywhere on the night showing off his unfair athletic ability. Kindle has found his home coming off the edge for the Longhorn defense but showed Thursday night the ability to play in space. The former Dallas prep star finished with five tackles, three of which were for losses, and a sack against the overmatched Aggies. Aggie quarterback Stephen McGee thought he had something to say after Kindle’s sack but quickly realized it would have been a very bad idea. 3. [tag]Brian Orakpo[/tag] – The soon to be first round pick made a huge impact in his first extended game action since the injury he suffered in the Texas Tech game. Orakpo is the most physically dominating player on the field every time he steps on the field. Even facing double teams and chips from running backs and tight ends, Orakpo is able to disrupt seemingly every play. He finished with a sack and a half and added four more recorded quarterback hits. The pressure the front four produces allows the secondary to get better each week. 4. [tag]Brandon Collins[/tag] – Seemingly all year long the young receivers have taken turns making an impact as the third receiver for the Longhorn offense. It was Collins’ turn this week. Collins had a team high 103 yards on a tied for team high six receptions. The sophomore did most of his damage on middle screens out of the spread set. His 20 yard touchdown catch in the second quarter gave the Longhorn offense the momentum it needed to get the scoring rolling. Texas would score a touchdown on the next four possessions. 5. [tag]Earl Thomas[/tag] – There will be no more questions on Earl Thomas’ speed. The freshman safety made two jaw dropping plays on the night, one being when he caught speedy Mike Goodson on what appeared to be a 90+ yard touchdown reception. Despite a bad angle Thomas caught Goodson and let him know about it. Thomas gives the secondary an edge and was in on a number plays on Thursday night in both the run and pass game. Thomas has bounced back from the end of the Texas Tech game with three outstanding performances from his safety position. 6. [tag]Quan Cosby[/tag] – The senior made his last game in DKR a memorable one by catching one of McCoy’s two touchdown passes. Cosby was one of the few players on this team that got on the field in the win over USC in 2005, so I’m sure he was happy to see the team back on top. Cosby has been McCoy’s rock all season and continued to come up with key third down and red zone completions. Cosby finished with six catches and 80 yards to go along with the touchdown. 7. [tag]Cody Johnson[/tag] – It is hard to account for two touchdowns and over 100 yards on the ground and not earn top five ranking but the truth of the matter is that Johnson’s yards came mostly when the game was out of reach. The big guy in the backfield did show some impressive speed on his 61 yard run late in the game. Johnson has continued to be excellent in his role as short yardage back, but could be so much more for this team moving forward if he can get his weight down 10 pounds or so. It will be interesting to see how the coaching staff uses the red-shirt freshman in the bowl workouts and in the Spring. 8. [tag]Roddrick Muckelroy[/tag] – Texas A&M managed to gain -24 yards rushing on the night. Texas’ run defense has been ranked in the top five all season in yards given up per game and while a lot of that may be attributed to the offenses that are ran in the Big 12 the man playing the best week in and week out against the run has been Roddrick Muckelroy. The junior is becoming one of the best linebackers in the [tag]Mack Brown[/tag] era. He leads the team in tackles on the year and seems to do so in every game. Muckelroy finished with a tie for the team lead with six tackles, including one for a loss. 9. [tag]Jordan Shipley[/tag] – Shipley had a quiet day by his standards for most of the game against the Aggies, but was able to come up with the highlight of the game on a 68 yard catch over the middle to set up a first and goal. Colt McCoy’s roommate, in case you didn’t know, caught for balls for 85 yards. Shipley seemed to be the focal point for the A&M defense which allowed other players, such as Collins, to step up. Did you know Shipley and McCoy go fishing and hunting together? 10. [tag]Roy Miller[/tag] – Roy Miller has played great in the middle all season for Texas. His impact cannot be measured by looking at the box score, but he finished with two tackles, a pass breakup, and two quarterback hits. Texas A&M could get nothing going up the middle from the run or screen game for the entire 60 minutes. Miller must be given credit for his lead blocking on short yardage situations for the offense as well. 11. [tag]David Snow[/tag] – Didn’t hear his name on Thursday? That is a good thing. With no fanfare at all the true freshman has stepped in to play center for a potential national championship team and nobody has even noticed. Texas continues to struggle in the run game and has not protected McCoy as well as they would like but Snow has stepped up tremendously with [tag]Chris Hall[/tag] injured. It is likely Hall will be back for the bowl game, and in that case Snow will get snaps at guard on top of backup center. Texas’ defense stepped up big posting a shutout in the first half and only seven points in the whole game. [tag]Colt McCoy[/tag] played another good game keeping the teams championship hopes as well as his Heisman hopes alive. Texas did what they had to do, but it may not be enough as they do not control their own destiny to either the conference or national title game. [tag]Sergio Kindle[/tag] – It just makes sense to have a defensive player at the top of the big board. When the game was in doubt the defense was suffocating. On three straight drives in the first half [tag]Kansas[/tag] turned the ball over twice on downs and fumbled. The reason for the success was the pressure on quarterback Todd Reesing. Sergio Kindle led the way off the edge with [tag]Brian Orakpo[/tag] limited in what he could do. Kindle managed a sack and a half but put pressure on Kansas all game. [tag]Colt McCoy[/tag] – McCoy just continues to perform at a level that none could have predicted. Most onlookers have probably waited for the Heisman candidate to come back to earth, but McCoy has done no such thing. He played good in the passing game, especially considering the conditions, and provided yards on the ground when the running backs struggled to do so. McCoy has been invaluable to this team. He controls everything the Longhorn offense does. He finished 24 of 34 for 255 yards and two touchdowns. McCoy added 83 yards and a touchdown on the ground. [tag]Quan Cosby[/tag] – For all of the pub that McCoy and [tag]Jordan Shipley[/tag] get for being roommates and child hood friends, it is Cosby that makes the Longhorn passing offense go. When Cosby went down in the Tech game it was obvious that the passing game struggled to find a new identity. Cosby puts Texas in consistent second and third and shorts and is the guy that stretches the field. He scored a touchdown in the second half while grabbing six balls for 70 yards. [tag]Roy Miller[/tag] – The senior defensive tackle is going to be the hardest Longhorn to replace next year. Miller has become a monster in the middle with the ability to play the run and the pass. He has become a leader on the team, and seemingly shows up with his “A” game every week. He recorded a half sack early in the game and made it impossible for Kansas to get anything going in the run game. The Texas defense has survived with Brian Orakpo so far, I’m not sure it would without Miller right now. [tag]Henry Melton[/tag] – Too bad Melton is a senior because he is a year or so away from becoming a dominant defensive end. His athleticism, especially his footwork, allows him to make plays despite being behind in his technique at the position. The former running back gets better every time he steps on the field as he has finally seemed to embrace being a defensive player. He finished with three tackles, a sack, and two tackles for loss in the win. [tag]David Snow[/tag] – It is hard to measure the play of the individual offensive lineman without knowing their assignments. But when a true freshman that has been splitting his time between two different positions steps in to play center on three days notice and you barely think about it the whole game somebody is playing well. Snow had one bad snap, on a short yardage play. It was hard to tell if it was a bad snap, a miscommunication, or if McCoy simply dropped it. With [tag]Chris Hall[/tag] coming back next year it is hard to see where Snow will fit in to the starting lineup. But one thing is for sure, he will get snaps somewhere. [tag]Eddie Jones[/tag] – The best thing that can come out of an injury to a key player is the emergence of the next star. It may be premature to call Jones a star, but the talent is there and a performance like his against Kansas can give everyone some hope moving forward. The former five star recruit showed his athleticism on a pitch play in the first half. He tracked down the running back in space and forced a fourth down play. His stat sheet doesn’t wow you, only two tackles, one being for a loss, and one quarterback hit. But with Melton and Orakpo being gone next year, it was nice to see Jones make an impact. [tag]Christian Scott[/tag] – It took one play for Scott to make an impact from his safety position. On the snap after Kansas running back Angus Quigley knocked starter Blake Gideon out of the game Scott came in and violently sent a message back. For the rest of the game Scott was all over the field. [tag]Will Muschamp[/tag] has said Scott possesses the most physical upside of any of the young safeties. Scott is going to have to be more than just a Saturday performer to get consistent snaps however. Muschamp wants hard work in the film room and on the practice field, and if Scott can put that work in Gideon and Earl Thomas may have some competition in the secondary. [tag]Blake Gideon[/tag] – Before the injury in the third quarter Gideon was playing one of his best games all season. He was making plays in the secondary as well as putting pressure on the quarterback in key situations. The true freshman is just a solid football player that puts his nose in any and everything he can. He flies around the field and always appears to be in the right place at the right time. Gideon appeared to suffer a concussion, so it will be interesting to see how cautious the staff is moving forward. [tag]Foswhitt Whittaker[/tag] – The Texas game struggled on the day, but Whittaker found a way to contribute in the passing game. In the first half he recorded all his receptions, a total of five for 42 yards. Whittaker is the one back on the roster that can put a defense on their heels and it was important for the red-shirt freshman to show he can block and catch out of the backfield. The staff needs to find better ways to get him the ball on handoffs, but the fact he was able to play as much as he did is a good sign for the Longhorn offense. [tag]Roddrick Muckelroy[/tag] – Muckelroy has been Texas’ most consistent linebacker all year long. He leads the team in tackles on the season and finished tied for second on the team against Kansas with six tackles. Kansas’ offense puts more pressure on the corners than the linebackers, but Muckelroy consistently showed up on plays. He swarms to the ball and provides support in both the run game and the middle passing game. The junior’s value, opposed to say a Jared Norton, is that he can play on every down in distance. He is no longer a liability in the passing game. Follow along below with our live thoughts and analysis during today’s Texas Longhorns game versus [tag]Kansas[/tag] on FSN. Participate in the discussion by following 40acressports on Twitter or by refreshing and commenting on this post. Texas enters their last road game of the year with a beat up football team. The weather is supposed to be bad with wind and cold weather in the forecast and a number of Longhorn players are banged up. As always players such as Colt McCoy and Roddrick Muckelroy will need to play well for Texas to keep their conference and national championship hopes alive, but some guys under the radar will have to step up to come away with the win. With the emergence of Chris Ogbonnaya and the comeback of a healthy Foswhitt Whittaker, the sophomore has become a forgotten man in the Longhorn backfield. Ogbonnaya is still suffering through an ankle injury while Whittaker doesn’t have the body to carry an entire games worth of runs. Because of this McGee has found himself still getting carries after a slow start to the season. In fairness to McGee he was banged up as well early in the year but appears to be back close to 100%. Quietly McGee has played extremely well in the last few weeks. On the road, especially in windy and cold conditions, good teams need to be able to get some plays out of the running game. Whittaker will be the main guy, but if McGee can come in and keep the chains moving the Longhorns may be able to wear out an undersized Kansas defense. McGee performs best when he is coming off the bench and with Whittaker and maybe Ogbonnaya in front of him this week McGee is right where he needs to be. Last week many were wondering if the true freshman from Gilmer was beginning to push the older guys at the guard position for some serious playing time. The coaching staff loves Snow’s mean streak and competitive nature. This week starting center Chris Hall went down in practice with a leg injury and with the dismissal of Buck Burnette for racist comments on the internet Snow finds himself the starting center for the first time in his career. Snow should get a challenge in his first start because it is on the road and opposing teams have been found of blitzing Colt McCoy. Snow has played mostly guard on the season, but Mack Brown says he still practices snaps before every practice. Certainly Snow has concentrated more on center for the past week and a half after the dismissal of Burnette. Having the quarterback in the shotgun for the majority of the game should help the young center, but if Texas looks lost in blitz pickup we’ll know the freshman is taking his lumps. Of course everyone looks for Kindle every game. He has become a dominant force on the Texas defense, and may have done enough over the season to become a hot target in this year’s NFL draft. This week don’t necessarily just watch Kindle’s play, watch where the junior lines up. Kindle is listed as a linebacker, but as the season progresses he has been lined up more and more at defensive end. For the first part of the season he only did this on obvious passing downs, but with Brian Orakpo missing last week’s game Kindle lined up at defensive end almost exclusively. Kindle excels when playing downhill and coming off the edge. He has struggled in space on pass coverage, so Will Muschamp has turned Kindle into Texas’ version of Lawrence Taylor. Orakpo is expected to be back, but it is unlikely he will be at full strength. Look to see the ratio of snaps at defensive end to linebacker for Kindle this week. The red-shirt freshman safety played his best game of his young college career last week against Baylor, a week after being one of the two players that gave up Michael Crabtree’s winning touchdown in Lubbock. It was huge for Thomas to bounce back and he did, showing the mental toughness that Muschamp has been glowing about since spring practice. Stop me if you’ve heard this before, but the young Texas secondary faces another tough test in the passing game. The young safeties have had their struggles on the season but they have played extremely well for the most part. The best evidence for that was the long pass play the Texas defense gave up on the first play Thomas was out with a minor injury. Ben Wells came in to replace Thomas and got beat deep for the only long passing play Baylor was able to muster against the Longhorns. Thomas was able to come back into the game and continued to play well. He may have been the best player on the field for UT’s defense last week and that kind of play will be huge again for Texas to avoid an upset in Lawrence. Most fans are hoping this game doesn’t come down to a field goal. Not because they don’t have confidence in the Texas kicking game, but because they feel UT should be able to win big against a struggling Kansas team. 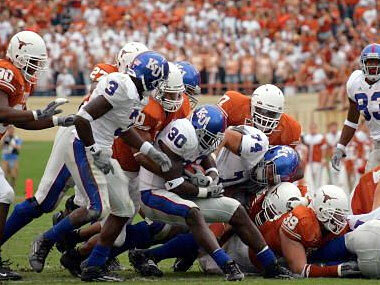 The last time Texas went to Lawrence they barely came out with a victory, so a close game is not out of the question. After being the place kicker last year Ryan Bailey lost his job in fall camp to Hunter Lawrence. The change had come without much fanfare because Lawrence was perfect on the season. That changed last week when Lawrence missed both of his field goals. In the end the misses did not matter, but when Texas lined up for their third field goat attempt Ryan Bailey trotted out for the try. Bailey made the kick and the questions about who would be the kicker going forward began before the referees even raised their arms. Bailey didn’t appear to do anything to loss his job, and he has proven he can make big kicks as he did in Nebraska. The coaches said Lawrence didn’t kick the last field goal because he was “sore”. We will know on the first field goal attempt if this was just lip service or not. Will the Texas defense overwhelm Kansas? The Texas Longhorns visit [tag]Kansas[/tag] this Saturday in what could become a classic trap game. They’re on the road, it will be cold, injuries are piling up, and they’re facing an underachieving team. The Jayhawks have struggled this season after shocking the college football world last season. 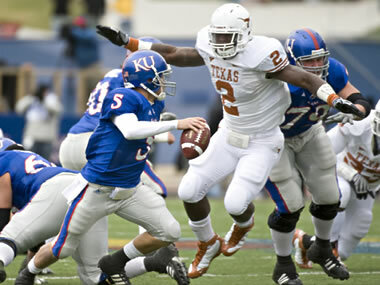 With all the BCS scenarios out there, the only thing Texas can control is how they handle Jayhawks. The last time a favored Longhorn team looking for a BCS berth went to Lawrence they got saved by a questionable pass interference call. Texas won’t get the benefit of refereeing on Saturday, so they must win it with a solid effort. Texas played a good game last week in the win against [tag]Baylor[/tag] even if it wasn’t as dominating of a performance as some would have liked. Texas quarterback [tag]Colt McCoy[/tag] continued his good play by throwing for 300 yards and five touchdown passes. Baylor was able to get into the passing lanes by dropping as many as nine defenders on passing plays. The Bears were able to get their hands on a number of McCoy passes and even were able to intercept three of the attempts on the day. It doesn’t appear any Big 12 defenses match up with the opposing offenses and Kansas is no different. The only thing that will stop the Longhorn offense is the Longhorn offense. The thing to watch is the offensive line play when Kansas blitzes. Junior [tag]Chris Hall[/tag] is going to miss the game, and with the dismissal of backup [tag]Buck Burnette[/tag] last week, true freshman [tag]David Snow[/tag] will get the start. It will be his first start and it will come on the road. Snow has played a bunch this year, but mostly at guard, and his calls up front will be key for protection. The coaching staff has been very high on the former Gilmer star and he’ll look to show why on Saturday. On the road in November is where a team needs a running game. It isn’t enough to run the ball when the other team lets you. A great team needs to be able to run the ball when the referees, the fans, and the opposing defense know the run is coming. Texas has yet to be able to do that this year, and it is unlikely that a running game is going to appear. Help has come in the way of [tag]Foswhitt Whittaker[/tag], but even the speedy freshman is not going to be the complete answer. With McCoy beat up and unwilling to be the running threat he was early in the year UT will continue to use a stable of backs. If Texas can come out and dominate the line of scrimmage this game will not be close, unfortunately that has been something this team has lacked thus far. The Longhorn offense will continue to go as McCoy goes. The lack of a consistent running game has put a huge load on the junior’s shoulders. He has responded in every way possible, and he is most likely going to have to do it again in order for UT to keep their national title hopes alive. The Longhorns are only one of five teams in the nation to have two receivers with over 60 catches on the season, and it is likely McCoy will continue to rely heavily on [tag]Jordan Shipley[/tag] and [tag]Quan Cosby[/tag]. Cosby played last week through an injury and should be able to go again this week. Any help from another receiver would be a bonus. The good news is that superstar [tag]Brian Orakpo[/tag] should be back and ready to go after missing last week’s game because of injury. The bad news is Texas is facing another quarterback that wants to send a statement to the UT coaching staff that they should have recruited him. Texas passed the first test when they spoiled the dream of [tag]Missouri[/tag] quarterback Chase Daniel. The Longhorns face another life long Horn in the form of former Lake Travis star Todd Reesing. Kansas has struggled protecting Reesing lately, and that figures to play right into the Longhorn defenses strength. In many ways Kansas offers the same set of challenges that the Missouri offense provided. Texas was able to get pressure on Daniel and cause disruption by getting their hands up in the passing lane. The defensive line was able to knock down numerous balls allowing the group to apply pressure because Missouri was in countless third and longs. Reesing is another quarterback under six feet, in fact it is probably the reason he is not wearing burnt orange on Saturday. Will Muschamp’s defense must disrupt the rhythm of Kansas’ offense by making them one dimensional and attacking. The only way Kansas hurts Texas is if the Jayhawks can get enough out of their running game to keep Texas out of pinning their ears back on third down. On paper it would appear the Longhorn front seven has nothing to worry about when it comes to Kansas’ run game. After a great start the linebacking unit for the Horns has struggled in the last few weeks tackling in space. Kansas does a good job of getting their skill players in space and exploiting the other team’s lack of athleticism. They don’t necessarily line up and run it at you, but they do a good job with screens and dump passes of getting their backs involved. The Longhorns will look to get pressure with four so the linebackers can shadow what the backfield of the Jayhawks tries to do. The group under the most pressure will be the secondary. Texas has been up and down in the back of their defense, sometimes in the same game, but that is to be expected with such a young group. They have been challenged seemingly every week, and they face another test on Saturday. Kansas is also one of the five teams in the nation with two receivers with over 60 receptions. The group is led by former quarterback Kerry Meier. He is great at running routes and finding holes in the zone. Texas is hoping [tag]Chykie Brown[/tag] is back from injury, but odds are even if he is the defense will look to put a number of bodies on Meier. The Longhorns need to get some stops early so the offense can put the game away. If Texas can put some distance in between them and the underdog Jayhawks this one will turn into a route. Can Sam Acho corral Baylor's Robert Griffin? The way players perform after a breakout or a disappointing game says a lot about them. With a few players out because of injury and the heartbreak of last week there are going to be some younger Longhorns that must step up for this team against Baylor. Most years the [tag]Baylor[/tag] game is considered a gimmie, but this Baylor team, led by new coach Art Briles and freshman quarterback Robert Griffin, is capable of giving the Longhorns everything they can handle. These five players need to step up for this program to have success this week and beyond. Finally after weeks of hearing that Fozzy was ready to play the coaching staff let the speed red-shirt freshman get some meaningful snaps. Once he was in the game Fozzy showed what many onlookers had been looking for from him. He averaged seven yards on only six carries in the second half of last week’s loss. Before those gains the Longhorn offense could do nothing on the ground. Whittaker’s speed and elusiveness allows him to make positive plays even when the blocking isn’t perfect. That is just what this team needs because the offensive line play has been far from perfect. Whittaker is a smaller back that has already struggled to stay healthy, so don’t expect him to get over 20 carries. Expect him to get 10 touches or so out of the backfield and a few touches on shovel passes and screens. Fozzy can be the playmaker this backfield needs for the next few years if the staff shows confidence in his ability to carry the load. Williams had his breakout game last week. He is another freshman with loads of upside. All year long Texas has been searching for a receiving threat to go along with [tag]Quan Cosby[/tag] and [tag]Jordan Shipley[/tag]. It took an injury to Cosby to allow Williams the opportunity to showcase his ability in a real game, but now that he has the hope is that he can continue to make a difference. Young players have the tendency to be inconsistent from one game to the next, so if Williams can back up last week’s effort with another solid performance the Longhorn offense may become that much better. Greg Davis’ offense has been reluctant to go deep throughout the year, but in the Missouri game and then last week, Williams has shown he is the type of player that can go up and get the ball. The more confidence Davis, and more importantly [tag]Colt McCoy[/tag], show in the young receiver the better this offense will be. Texas Tech’s defensive line whipped up on UT’s offensive line for most of the night. Tech was able to get pressure on McCoy and shut down any thought for a consistent running game. Older guys like [tag]Cedric Dockery[/tag] and [tag]Charlie Tanner[/tag] are getting more and more of their snaps taken away by the younger guys. One of those younger guys is true freshman David Snow. Snow will start on the line somewhere next year. Offensive line coach Mac McWorther loves his mean streak. He has compared him to a bigger and more athletic [tag]Kasey Studdard[/tag]. No higher compliment can be made in my book. With the offensive line woes it wouldn’t be completely out of the question to see Snow get a start of Dockery by the time the year ends. The one thing that may keep Dockery’s job safe is the hole left at backup center because of the departure of [tag]Buck Burnette[/tag]. Snow will be the primary backup to starter [tag]Chris Hall[/tag] and the snaps he will have to dedicate to center at practice may keep him off the field at guard as a starter. Don’t be surprised to see next year’s potential starting lineup on the field at the same time with Michael Huey and Snow replacing Tanner and Dockery at guard. It appears to be certain that starting defensive end [tag]Brian Orakpo[/tag] is going to miss the Baylor game because of the leg injury he suffered last week. His primary backup has been sophomore Sam Acho. Early in the year, and certainly during preseason camp, Acho impressed the coaching staff with his endless motor and nose for the football. Keeping containment while applying pressure will be crucial in this game because of the type of player Baylor’s quarterback is. Next year the Longhorns lose both defensive ends and it looks like Acho will definitely be one of the replacements. Just like Cosby’s injury allows guys like Malcolm Williams and Dan Buckner an opportunity to showcase their future ability, Orakpo’s injury gives a chance to emerging players such as Acho and [tag]Eddie Jones[/tag]. If Acho and Jones can gain confidence with Orakpo out of the lineup it will do wonders for this defense as it heads into the off season. The true freshman from Leander has exceeded everyone’s expectations. Not only has he come in to a program that many felt he couldn’t compete at and held his own, he has found himself as the starter for a top 5 team in the nation at safety for every game of the year. Gideon by no means lost the game last week with his drop of a potential game winning interception on Tech’s last possession, but with a young guy who is such a competitor it is likely he walked off the field believing he did. From everything we have seen of Gideon it would appear he would bounce back and use the adversity to get better. The worry is that he’ll play like a deer in the headlights for the rest of the year trying in vein to not make another key mistake. Secondary players must have a short memory, a lesson Gideon will have to learn early in his college career. As a coach’s son and a classic overachiever there is no reason to believe he won’t. Look for him early to see if he can make a play to restore some much needed confidence. Can the Texas defense step up without Brian Orakpo? For the first time in over a month Texas faces an opponent that hasn’t been ranked in the top 10 at some point in the season. The players and the staff faced the challenge of staying “up” for such a difficult streak of games, but getting “up” for a game against an inferior opponent like [tag]Baylor[/tag] after a heartbreaking loss may prove to be more of a challenge. Texas appears to have an advantage at every position, even with [tag]Brian Orakpo[/tag] and [tag]Quan Cosby[/tag] not likely to play. The Texas offense found their stride late in the Tech game after struggling to get anything going in the first two and a half quarters. [tag]Colt McCoy[/tag] had a decent game, but it was no where near the level he had been playing at before the second half of the [tag]Oklahoma State[/tag] game. The Longhorn offense struggled after Cosby went down, but the emergence of Malcolm Williams as a deep threat could be the silver lining. When Cosby is able to get back, and he will at [tag]Kansas[/tag], Texas will finally have a three wide receiver set that scares opposing defenses. The biggest concern coming out of the loss in Lubbock is the play of the offensive line. The big guys up front got beat up for most of the night night. They couldn’t open up holes for the run game or protect McCoy in the passing game. The ability is there, and if some of the older guys like Cedric Dockery and Charlie Tanner don’t step it up they may lose more snaps to younger guys like [tag]Michael Huey[/tag] and [tag]David Snow[/tag]. Texas’ offense has gone all year without a consistent run game and it is probably naïve to believe one is miraculously going to appear. The hope for Texas is that a healthy and utilized [tag]Foswhitt Whittaker[/tag] can provide enough of a spark to take some pressure off of Colt McCoy. 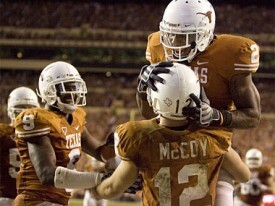 McCoy proved to be human last week and in those games the Longhorns have to be able to run the ball to stay effective. They couldn’t in last week’s loss and it may have cost them a shot at the Conference and National Championships. Texas should be able to move the ball against Baylor. The Bears defense has allowed over 30 points in five of their last six games, all of which were losses. Applying pressure and creating turnovers are the only way Baylor stays in this game and the Bears defense has not been good at either. This is not your older brother’s Baylor offense. First year coach Art Briles found his future in his first year. That future goes by the name Robert Griffin. The freshman quarterback has been nothing short of outstanding. He can run and pass, and was the last quarterback in Division I to throw an interception. For the first time in a long time Baylor has a player that can scare you on every play. The Longhorn defense played well in the second half last week. The only touchdown they gave up came with one second left in the game. The task this week will be to rebuild the psyche of the young secondary. [tag]Curtis Brown[/tag], [tag]Blake Gideon[/tag], and [tag]Earl Thomas[/tag] all had a forgettable last minute of the game, and each of them may have left the field with the feeling they were the reason their team is no longer number one in the nation. The staff and fellow players have spent a whole week assuring these guys that one play and one guy has never lost a football game. But with young emotional players no one can tell how they will react their next time out. They could turtle up and play tentative from here on out, or they can feed off of the emotion and become better football players because of it. Texas lost their best player for the week in Brian Orakpo. Most would believe that Texas doesn’t need Orakpo to win the game, but when facing a dual threat quarterback like the one Baylor has every team would want to be at full strength. Just like on offense, the biggest concern heading out of last game was the play of the defensive line. Texas Tech’s offensive line won the individual battles last week. Baylor won’t have the talent that Texas faced last week and it will be important to regain confidence with early pressure. Texas’ speed should be able to nullify most of what Baylor would like to do. Even with Orakpo out Texas should be able to get pressure with [tag]Sergio Kindle[/tag], [tag]Sam Acho[/tag], and [tag]Henry Melton[/tag]. The key for this defense will be keeping Baylor out of manageable third downs. If Texas can force Baylor’s freshman quarterback into long distance plays, one would think defensive coordinator Will Muschamp can overwhelm him with schemes. 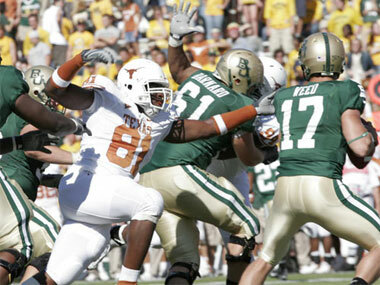 The Texas offensive line struggled through the 2007 season due to injuries and inexperience. Injuries to important senior players forced young guys to step in and play before they were ready. Those struggles last year should however prepare the group for 2008, as every starter has significant playing experience and nine of the top 10 guys have seen previous playing time. [tag]Adam Ulatoski[/tag] and [tag]Kyle Hix[/tag] are entrenched as the starting tackles. Ulatoski is the most experienced player on the line but will be moving from the right side to the left to protect QB Colt McCoy’s blindside. Various serious and nagging injuries have prevented him from becoming the dominant tackle Texas fans thought he would be, but he’s still only a junior and he’s finally healthy so this could be a big year for Ulatoski. On the other side, Hix played in every game last year as a true freshman and started at right tackle in the Holiday Bowl. He was a top recruit in the state and expectations are high for him for this season and his career. [tag]Tray Allen[/tag] and [tag]Britt Mitchell[/tag] will be the primary backups at tackle. The guard positions aren’t as set in stone. The current starters are [tag]Charlie Tanner[/tag] and [tag]Cedric Dockery[/tag] but there is also a lot of noise about sophomore Michael “Baby” Huey. Tanner and Dockery were the starters for most of 2007 and each is a consistently solid performer. Dockery once looked like he’d follow his brother Derrick to the NFL but missed significant time with a serious knee injury in 2006 and is hopefully finally at full strength now. The three players will likely all see good amount of playing time early on as the coaches see if Huey can unseat one of the veterans. True freshman [tag]David Snow[/tag] is the fourth guard on the depth chart and looks to have a bright future. [tag]Chris Hall[/tag] looks to have finally found a permanent home. After spending time at all five positions on the line last year as a sophomore he’ll anchor the line this year as the starting center. His intelligence and experience at every position should let him excel as the quarterback of the offensive line. Talented backup [tag]Buck Burnette[/tag] needs to be ready in case Hall is required to shuffle around again this season. They may not get the pub other positions do, but the offensive line is the most important piece of any good football team. After a rough 2007 season the line should be a strength in 2008. If they stay healthy it’ll mean more time for McCoy to pass and more holes for the running backs to run through, which in turn means a more consistent offense. The big one got away today (under suspicious circumstances) but the 2008 Texas recruiting class is still a good one. Mack Brown and the Horns signed 20 young athletes to letters of intent, nine of which are already on campus for the spring semester. The class is headlined by defensive backs Aaron Williams and DJ Monroe, who along with safety Nolan Brewster, should anchor the Texas defensive backfield for the next four or five years. On the offensive side WR/RB DeSean Hales is electric with the football in his hands and wide receiver Dan Buckner is huge and will catch anything thrown in his general direction. Congratulations to the newest Texas Longhorns!